A number of tech blogs have shared a video from Chinese website M.I.C. Gadget that claims to provide the first real look at Apple's next-generation 4-inch iPhone, but there are some clues to suggest the mystery smartphone may simply be a regular 4.7-inch iPhone 6 or iPhone 6s. First and foremost, the distance between the speaker grille, pentalobe screws, Lightning connector, headphone jack and microphones appears to be the same as the iPhone 6s. If this were truly the so-called "iPhone 6c," those components would need to be closer together on the bottom of the smartphone. The much-rumored "iPhone 6c" may feature a 64-bit Apple A8 chip, 1GB of RAM, 16GB and 64GB storage sizes, 8-megapixel rear-facing iSight camera, improved FaceTime HD camera with ƒ/2.2 aperture, Apple Pay, Touch ID, VoLTE calling and more. The smartphone could launch by the end of March for around $500. 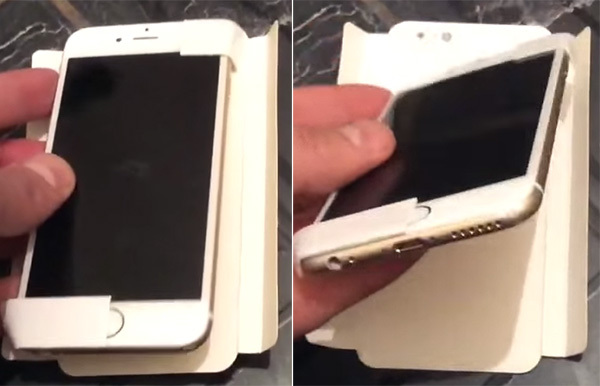 Umm, this is definitely 100% an iPhone 6 or 6s. Why is this even an article? Oh look, a headphone jack! The much-rumored "iPhone 6c" may feature a 64-bit Apple A8 chip, 1GB of RAM, 16GB and 64GB storage sizes, 8-megapixel rear-facing iSight camera, improved FaceTime HD camera with ?/2.2 aperture, Apple Pay, Touch ID, VoLTE calling and more. The smartphone could launch by the end of March ('https://www.macrumors.com/2016/01/11/iphone-5e-a8-1gb-ram-apple-pay-volte/') for around $500. I would love to go back to a 4" size, but I'm not buying a new iPhone that has the same specs as my 2014 iPhone 6. A9 and 2 GB ram and I'd gladly buy one. Someone who's not as lazy as me should measure the headphone jack and lightning port since those are constants that can be compared to the overall width. I probably could have measured it in the time it took to write this. Looking at this image and the article's bottom view image you can clearly see it is an 4.7" iPhone 6/6S. A 4" screen body wouldn't have the exact same layout, since the smaller body would probably have about 4 holes for the speaker, or smaller space between. Just a guy with big hands. Move along, nothing to see here. Because it generates clicks which drives advertising opportunities and makes MacRumors money. They'll report on anything if it'll get people to click and make money. No, there's a difference between a rumor and an all out farce. This would be an example of the latter. I enjoy how he has the time to film it and show it off but lacks a ruler to show size. :rolleyes: Honestly looks like a 6/6S without any reference of size.